AMIDST the sound of hammering and sawing and the smell of new paint, I watched the finishing touches being put to the Cultúrlann’s £1.9 million refurbishment ahead of its official unveiling on Monday. A landmark building in the heart of West Belfast’s Gaeltacht Quarter, the building has been undergoing extensive work to incorporate a new exhibition area, the Gerard Dillion Art Gallery, where regular exhibitions will take place, and an interactive “interpretive space”, where visitors can learn of the development of the Irish language in Belfast. Sitting in what will be her new office, a former dingy attic now flooded with light and colour, Cultúrlann Director Eimear Ní Mhathúna told the Andersonstown News the next few days really will be a case of “all hands on deck”. Eimear said she hopes the new Cultúrlann can be a catalyst for other things to happen in the Gaeltacht Quarter. “There is a great sense of excitement in the area, not to mention among the staff. People are proud to see this happening in their own area. I think it’s a massive boost for everybody, the Gaeltacht Quarter is starting to happen and there is a real multicultural feel to the place and a real celebration of diversity. People are always made to feel welcome here – the Cultúrlann is, and always has been, open to everybody,” she said. The new art gallery with its striking glass is the sight that will grab commuters the most as they travel up and down the Falls Road. 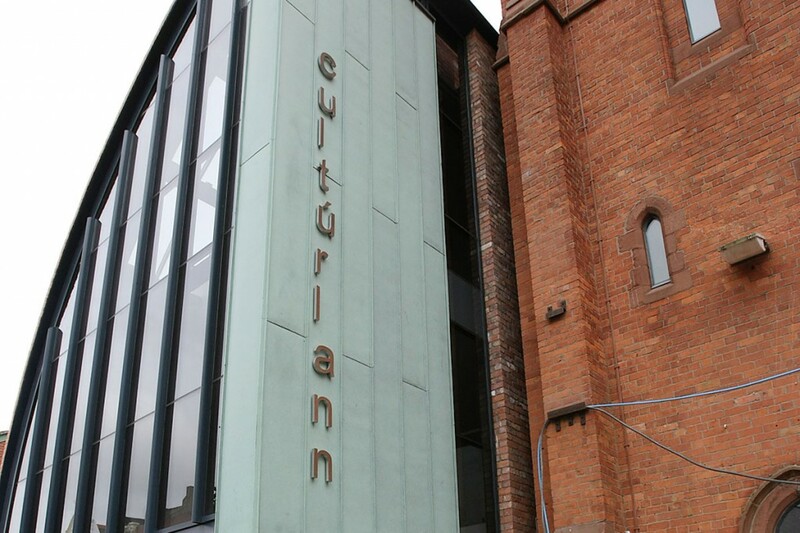 The Cultúrlann has also built on a roof-top terrace for sessions, poetry readings and an extra event space. President Mary McAleese will officially open the new extension on Monday, a fitting choice, as Eimear says she has been “great for Ireland”. But the opening is not the end of the hard work.